I was in Melbourne recently to visit my sister and her family. This would be my third trip there but it has been more than 20 years since my last visit. Surprisingly I don't think much has changed around the city unlike here in Singapore where construction is constantly going on. I didn't do the "touristy" stuff as I had done that many years ago. I stuck mainly to the suburbs but did go into the city on a weekday. Unfortunately that day happened to rain and the skies were really gloomy. So you could have called it a "wet experience". The rest of the week was good and sunny, by Melbourne standards, temperatures ranging from a high of 21C to a low of 14C. It is nearing the end of autumn, with winter coming round the corner. So it gets dark by 6:00pm. I popped into the local supermarket, Coles, on several occassions as it was just a 10min walk away. Coles has an amazing range of produces with fresh cuts of meats of all varieties, vegetables, fruits, cheeses and a whole lot more of stuff which would probably take 4 pages to list out. Take a simple produce, for example eggs which we take for granted. At Coles the eggs are labelled "caged eggs" and "free range eggs" and comes in different grammes per egg. The difference in price differs a fair bit as well. Free range eggs cost about 3.5 times more than caged eggs. By labelling the eggs as such it gives the end consumers a right to make concientious choice when buying their produces. Whilst at Coles I managed to buy a bunch of fresh rhubard (in fact I was actually on the look out for it) and hope to experiment with it this coming weekend. I have never had a rhubard before so this would be really interesting. I will post the end results for sure! 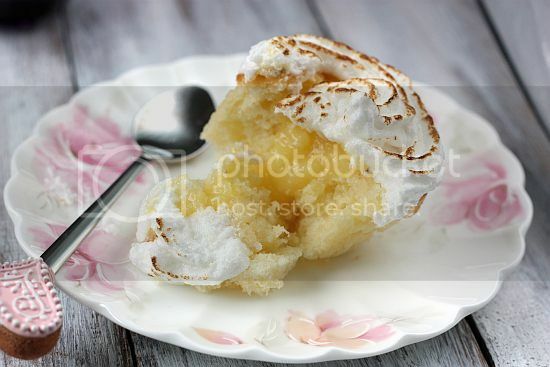 I thought it was somewhat befitting to post this particular Lemon Meringue Cupcake recipe as it was first featured in Australia Junior Masterchef. If you have not watched this show as yet, what are you waiting for. You will surely be amazed by the amount of talent shown by these young cooks, some as young as eight years old. 4) Remove from the heat and add the lemon juice, adding more to taste as desired. 1) In a very clean and large bowl or the bowl of a stand mixer place the egg whites. Whisk until soft peaks form and then gradually add in the sugar a little at a time until the meringue is thick, smooth and glossy and all of the sugar has dissolved. 1) Preheat oven to 180'C. Place 12 patty cake liners in a 12 hole 1/2-cup capacity muffin pan. 2) Place cream, sugar and eggs in a large mixing bowl and whisk until smooth. Gradually add flour and zest and continue whisking until mixture is thick and smooth. 3) Divide mixture between prepared liners and bake for 15-20 minutes or until cakes spring back to touch. Cool in muffin pan. 4) To serve, preheat grill to medium-high. 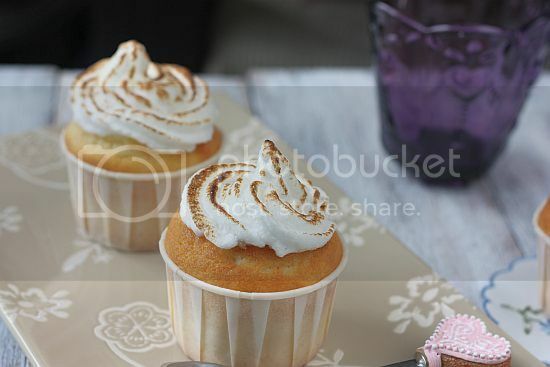 Cut a small hole in the top of each cupcake and fill with 1-2 teaspoons of lemon curd. 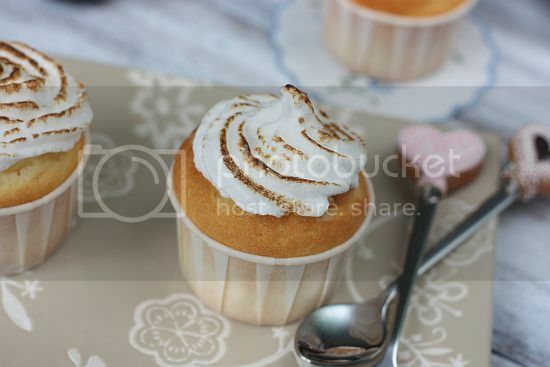 Pipe a swirl of meringue mixture on the top of each cupcake and place under heated grill for 60-90 seconds or until golden. Oh I would love to see what you'll churn out with the rhubarb. 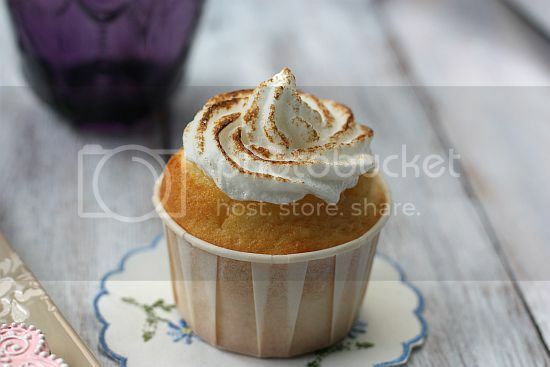  these lemon merginue cupcakes seems to be such a popular recipes among the bloggers! yours looked very pretty & tempting! But I have my eyes on another recipe from Junior Masterchef (gotta love that show!) hopefully can try out soon. Lastly, welcome back! Jo I am like you, very keen to know more about rhubarb. I remembered when I was staying in Melb, one of my favourite supermarket was Coles. It was really huge with isles and isles of foods and other stuff. I also like Safeway though. However, at that time, my favourite place for grocery was Franklin where I like to buy their 'no frills' brand. Which suburban area were you at? 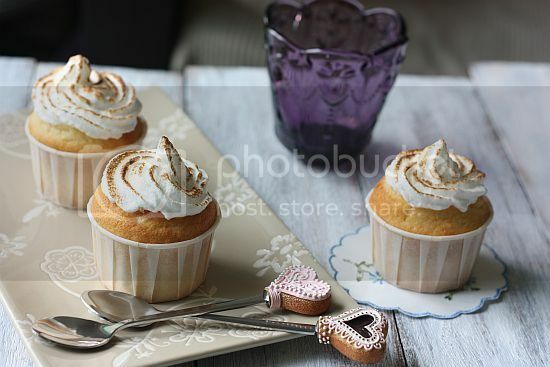 Your lemon meringue cupcakes looked very pretty and yummy. Hi Jane, I was at Croydon. I went to Woolworths as well but found Coles to be much nicer though. How pretty! The lemon curd filling looks so great. Masterchef and really enjoyed it. They are all so talented! Im a beginner at this and would like to try... what is pure cream? And where can i get it and which brand?i reside in Singapore..